8th Floor, Sona Towers, 71 Miller Road, Bangalore – 560052, Karnataka, India. 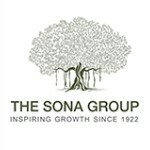 The Sona Group is a premier business group in India. The origins of the group can be traced back to pre-Independence India. The Group was founded by Kalvithanthai Karumuttu Thiagaraja Chettiar, who was moved by the plight of tea garden workers in the country. He was inspired to empower his fellow countrymen and enhance India’s economic development. He aimed to achieve this lofty goal through industrial development that would result in the employment of Indians. Since its inception in the 1920s, the Sona Group has pioneered India’s growth in the fields of agriculture, textiles, construction, IT, and education. Our founder empowered tea plantation workers in India the way Gandhiji empowered mining workers in South Africa. The two men formed a lasting friendship. In 1938, it was in Kalvithanthai’s house that the famous ‘loin cloth’ incident took place, where Gandhiji removed his shirt and vowed never to wear one again after seeing daily wage laborers who could not afford even a shirt.